Semillon, is a fairly easy grape to grow. It’s major fault is interestingly, its best loved virtue. Semillon is prone to developing rot. This is a good thing because Semillon is especially susceptible to being struck by botrytis, also known as noble rot. Once Semillon becomes infested with botrytis, it also develops amazing characteristic sought by lovers of sweet wines all over the world! For those reasons Semillon remains one of the most popular and important wine grapes in France. 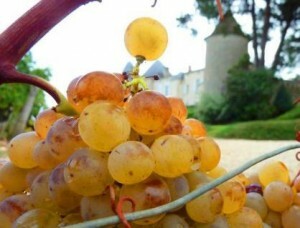 Semillon, with its thin skin, low acid fruit and rich, oily profile is perfect for Sauternes. In fact, it is the dominant grape variety in the entire Sauternes appellation that is used to produce sweet, white, Bordeaux wine. While it’s also planted in Australia, America and other regions, it reaches its full potential with the sweet, white, Bordeaux wine that is from the Sauternes and Barsac appellations. It is also an important blending grape used to produce dry, white, Bordeaux wine in Graves Pessac Leognan, as well as in Entre-deux-mers. In Bordeaux, the Semillon grape is blended with Sauvignon Blanc and Muscadelle. Part of the reason for this is, while Semillon has body, depth and concentration, it is low in acidity. The addition of Sauvignon Blanc adds the freshness and lift that really makes the wine sing. However, a few small, Bordeaux producers makes a dry white wine from 100% Semillon, Chateau Memories, Chateau Franc Baudron, and Chateau Le Puy in the Cotes de Francs appellation. All 3 wines are sold as generic Bordeaux AOC wines. It is important to note, not all sweet, Bordeaux wines are produced from blends. Most notably, Chateau Climens in Barsac makes a distinctive wine from 100% Semillon. Chateau Climens is not alone in producing sweet, white Bordeaux wine from 100% Semillon. Cuvee du Chateau Caillou is produced from 100% Semillon and some vintages of the rare and expensive wine from Doisy Daene, L’Extravagant are also from 100% Semillon. The special cuvee from Chateau Coutet, Cuvee Madame is also produced from 100% Semillon. The magic of Semillon takes place due to botrytis. When a grape is attacked by this rot, the berries are consumed by the development of rot. They shrivel on the vine. Sugar levels ratchet up and as the grapes dry and lose water, they become incredibly concentrated with sweet fruit, roasted nut and honey coated, tropical flavors. Semillon when ripe, and especially in sweet wine, helps produce one of the best food and wine pairings on the planet according to some wine and food lovers. For example, foie gras and Sauternes is a perfect wine and food match. Foies gras works with other sweet white wines, due to its naturally rich, fat textures and its natural sweet, salty and savory characteristics, is always a special treat. Semillon and spicy food or Asian cuisine is another natural wine and food match. Semillon works well with seafood, especially shellfish, pork, veal, chicken, game birds or dishes with cream sauces. Cheese, hard and soft is another great pairing for Sauternes or other sweet wines, especially blue cheese. Semillon was at one time a very popular white wine varietal. That explains why there are so many old Semillon vines in Bordeaux. In fact, the average age of the Semillon vines planted in Bordeaux are close to 40 years of age. It was widely used for the production of dry white wines. In fact, in the early 19th century, the grape was thought to be the most widely planted white varietal in the world. It inhabited 90% of all of South Africa’s vineyards. As a point of reference, today, the grape covers about 1% of South Africa’s vineyards. To combat the loss of the vines and the ever decreasing amount of clones available, in 2008, a group of seventeen different Bordeaux wine producers agreed to form a cooperative that focused on growing their own Semillon clones.